That cute little guy makes the best shadow shot of all!! 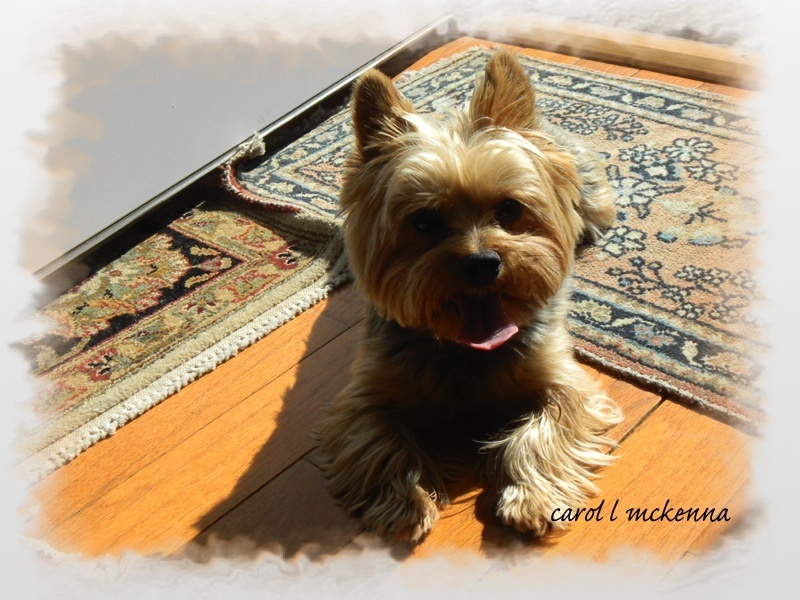 Hope you're both having a great weekend, Carol! what an adorable shadow shot!!! the Art Muse may not be real big by himself - with the shadow added he is really double in size - and twice as cute too! The bear and Raggedy Ann are quite an artistic couple...I hope for a warm day in paradise! Hi! Beautiful sketch and various kind of cool photos! The first strong spring winds were felt yeaterday in Tokyo, just like your Haiku. Puppy is so adorable and the gentle beach scene captures my heart. Love the little rabbit sketch! Is that your little doggie's magic carpet. :) So cute! I've never heard of one line Haiku but I like yours a lot! We had snow today so I don't think we'll be flying kites anytime soon. I like how you compose your posts for various themes. All well done. What a adorable little bunny! And Art Muse is just the cutest ever! These are great school masters. Your post today reminded me of Beatrix Potter and her tales. Lovely artworks, nature shots and haiku. Have a wonderful Sunday! Art Muse Dog looks lovely in his shadowy pose! Lovely sketches and beautiful photos. Love the rabbit sketch, reminds me of peter rabbit. The critter sketch is so sweet. Nice collection of photos. I love your sketch of the bunny! 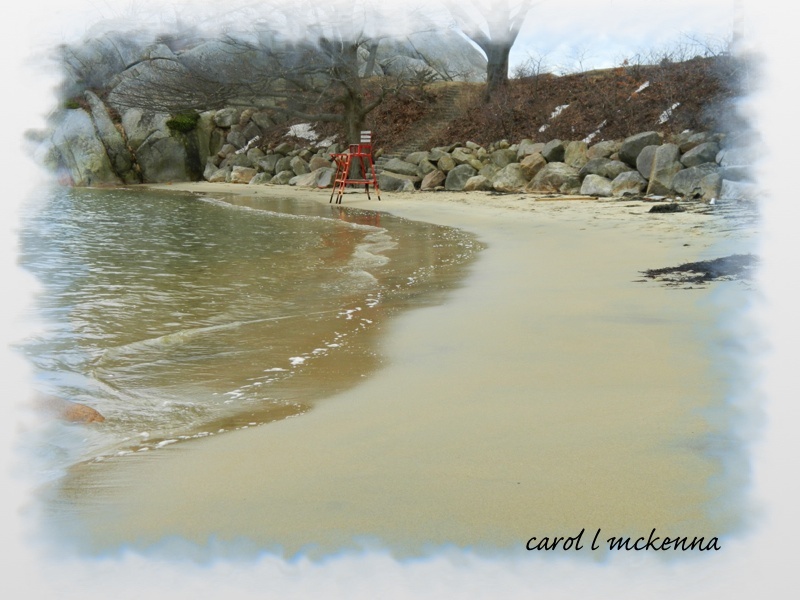 love your photos...beach scene especially, and the raggedy dolls a fun childhood memory evoked! Love those mellow yellows! I always enjoy your weekend collections! I love the bunny sketch and the one line haiku. As always, a joy to visit. :) Hope you are having a great weekend! ArtMuse looks sweet. I like your one line haiku. Love the paradise scene with the empty lifeguard chair and the light and dark of the sweet little doggie. i hope today finds you feeling much better and ready to discover spring. love each of your photographs and your wonderful quote for today. glad always to have you and a taste of your paradise. Great entries for all of your linkies!!! I love your one line haiku. I looked up the rules and if I am right it doesn't seem to matter how many syllables are used. Do you have a formula for one liners? Carol, love your cute bunny sketch! And Artmuse Dog is looking adorable as ever! Fun haiku, I am looking forward to spring. Have a happy week ahead! Love your pup's shadows! The bunny sketch is adorable! Great variety Cario - you've been busy! Well I love all of these images, the sketch of the rabbit, the photo of your pup, the lovely one for Postcards and all those gorgeous spring photos. Great work, Carol! My wind gusts go though a variable length tapered metal tube. I actually saw someone flying a kite today, so I appreciate your one-liner! Beautiful images. Those sketches are cool. Lovely takes on all the different themes! Your little dog is beautiful. He looks like my little Pogo, only your dog has more hair. I enjoyed your sketch and other photos. Good to meet someone else from Massachusetts. Have a great day. 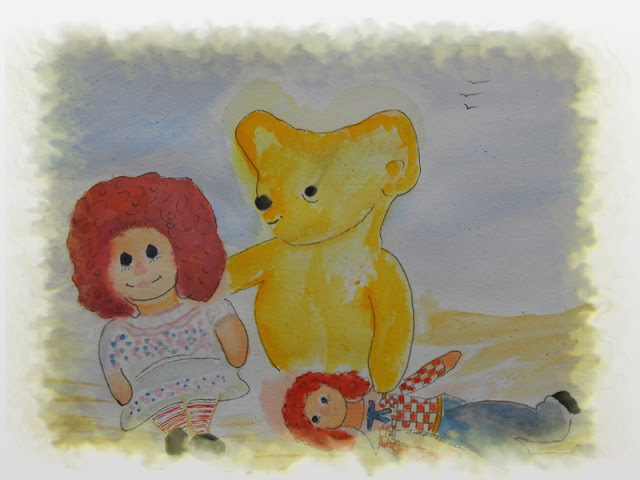 Adorable bunny, yellow bear and signs of spring are lighting my heart! Thanks! Oh you're covering a lot of bases! I'm visiting from Mary's Mosaic Monday. Love those rich greens showing up in your mosaic. Beautiful series of shots. Happy MOM! Lovely shots. The dog is so cute.Have a fabulous week! They're all great, but I love the sweet bunny! Thanks for visiting my blog and for your comment. What sweet drawing. 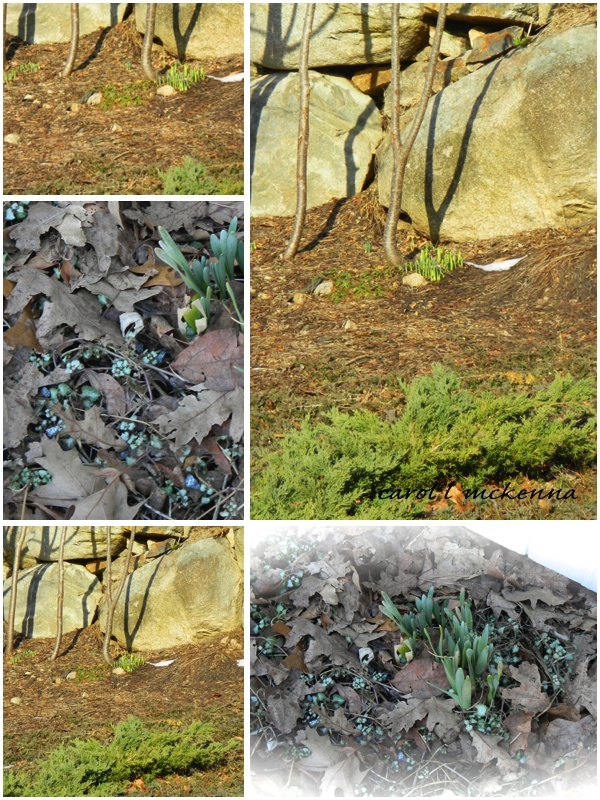 So glad you are having the first signs of spring too. Hope that you have a wonderful week. ArtMuse Dog is so sweet, just sitting there patiently to have his photo taken. I just want to give him a big hug; lovely shots, artwork and words. Love your darling sketches and your pooch is so darn cute. What talent you have. Loving the signs of Spring here! Beautiful photos. I love the dog.He/She is so cute. ah the delight of spring bulbs emerging. I think your haiku today says go out and enjoy life! Cute pics, & one line haiku - nice. Beautiful! The sweet dog is so cute! What an adorable, cuddly bunny! I also love your raggedy anne dolls, too. :) Still sick here so getting around slowly. Catching up with Mellow Yellow entries. The bunny in your sketch reminds me of the bunny that visits me every day. 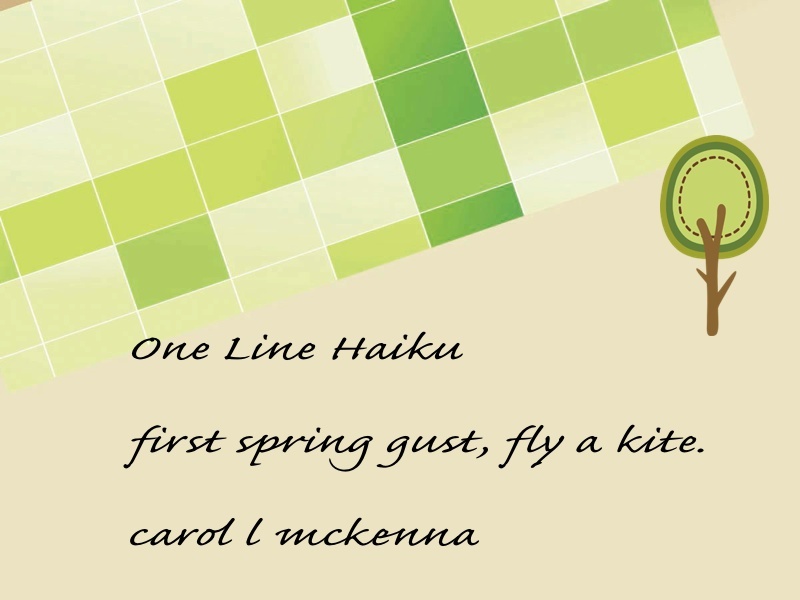 Lovely haiku ...spring winds will be here soon! beautiful bunny and haiku. thank you for sharing your creativity every day with us. Big hugs.